At least you’ll look the part! 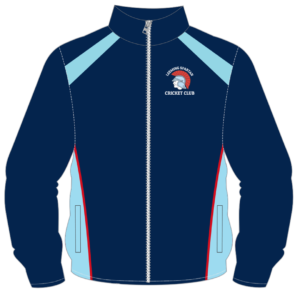 Sublimated (not stitched) sponsor logos add to the comfort, meaning that you don’t feel them when moving. It also ensures that they don’t fade when washing. Be the envy of the opposition. Our Match Day Shirt includes an easy-stretch and non-scratch material, meaning you are free to run (or jog!) around all day, without ever having to adjust your shirt. We’ve also returned to the Test Cricket standard – cream. 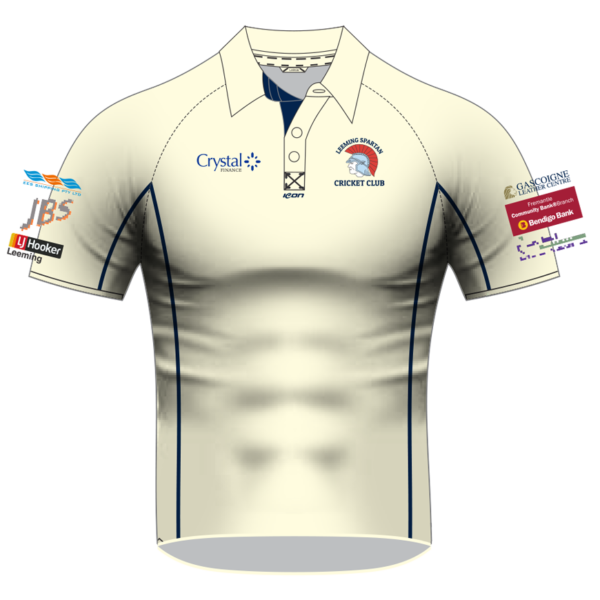 Cream (or off-white) playing shirts not only provide a nicer and more professional look, they are more comfortable come the hot days! The professional design, with its new navy blue collar internals and piping means that our Spartan members are easily the best dressed come game day! 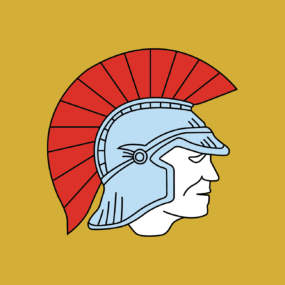 Show off our fantastic Spartan Sponsors whenever you are wearing our match day shirts, with our gold and platinum sponsors’ logos on the front and sleeves of the shirt. 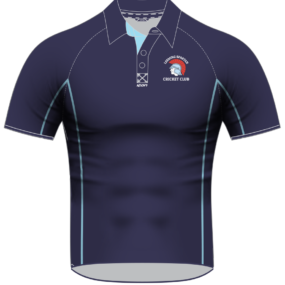 Our Leeming Spartan Match Day Shirts are a compulsory part of the Spartan kit, as they are the only acceptable shirt to be worn during official matches. 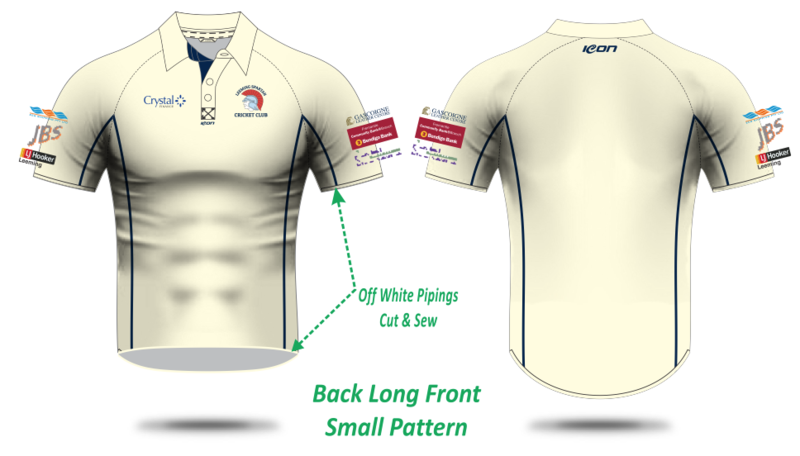 Our Spartan Match Day Shirts are designed by the experts – ICON Sports, who supply clothing to all of the major WACA Clubs (including Perth Cricket Club), and several football teams, Australia wide! The super soft, stretchy material means that our Spartan Match Day Shirt isn’t just the best looking but also the most comfortable! Regardless of skill, you’ll at least be the best looking bunch out there! We highly encourage our members to update their match day shirts whenever possible, as we feature our platinum and gold sponsors on the front and sleeves! Help show your support of the incredible major supporters of the Club, those who help keep us afloat every year, by strutting your stuff in our Spartan Match Day Shirts!! It is definitely the perfect way to show your appreciation for our wide range of supporters, without whom, we simply could not exist. 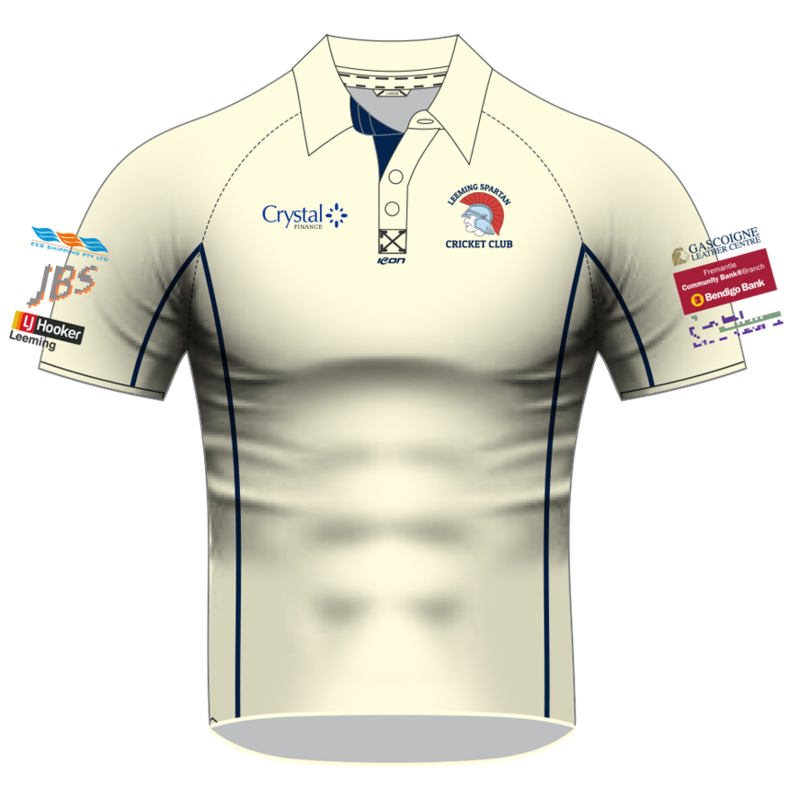 Don’t wait for cricket season to get your hands on our great Spartan Match Day shirts! We can ship them directly to your door for just $10.00 more! Bundled shipping is also available for multiple purchases! 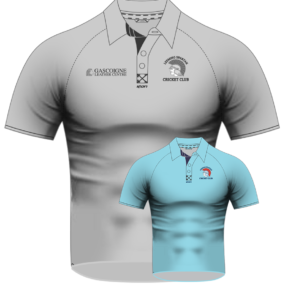 Our Spartan Match Day Shirts are available in all sizes, and come in both men and women’s (on backorder) varieties! From small to 6XL, there is a Spartan shirt in the correct size for everyone! 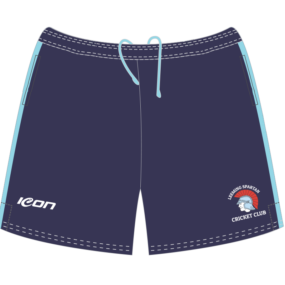 Designed by cricketers for cricketers. 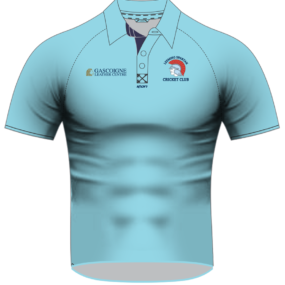 Spartan Match Day Shirts have been engineered by one of Australia’s leading sportswear companies – ICON Sports. 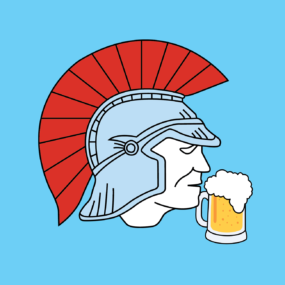 Thanks to the guys in the know, we know just how great our Leeming Spartan Match Day Shirts are! A special thank you to Jon Wells (Western Australia shield cricketer and Hobart Hurricanes opening bat) for the excellent quality clothing! The shirt of choice for our friendly matches. 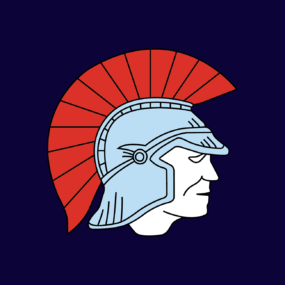 The Leeming Spartan Cricket Club holds a number of inter-club or ‘friendly’ matches, including T20s, and our Match Day Shirt (together with our Training Shirt) are the best kits to wear come game time! It really is the best way to show that you’re a Spartan when you’re on the field! You can also be a winner in our Spartan Match Day Shirt!